The Internet only become more and more important to business owners in the last 5 years. Although 5 years doesn’t seem like a long time. It’s surprising to see just how far technology has come in that short space of time. The internet has made communication easier. Dissemination of information and other data has became almost instantaneous. People from all around the globe can now be connected. It has become a solid platform where people can transact and conduct business twenty four hours a day, seven days a week. There’s no restrictions on opening and closing hours and it has opened up the doors to essentially millions of people who can visit your business page. 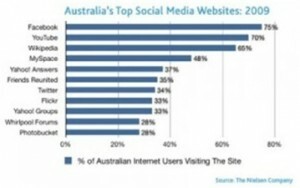 In this article, I am going to show you a glimpse of the current trend of internet usage specifically for Australia. 17,033,826 Internet users as of Aug/2009, 80.1% of the population, according to Nielsen. 9,520,960 as of August 31, 2010, according to Facebook. 4,700,200 Broadband subscribers (connections) as of Sept./07, 22.8% of the population, according to OECD. G.N.I.p.c. = Per Capita Gross National Income in US dollars, historic series. 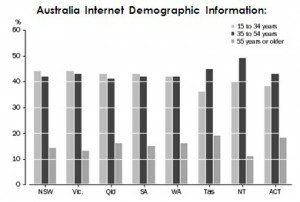 According to this data, Australian internet users are mostly in the 15 to 64 years old age bracket. This only means that most of them already have the capacity to purchase. The statistics I have gathered clearly shows that Australians are not shy when it comes to purchasing both goods and services online. Australia is now the third highest country in the world when it comes to utilizing e-commerce. The internet isn’t a story of how beneficial it is for home usage anymore. The internet now presents an opportunity for your business to step up and reach out to more potential clients. Internet marketing is not easy as it seems but through the proper marketing techniques, and strategy – you’ll reap the harvest of your investment. The key to internet marketing is to go where the people go. Facebook, Youtube, Myspace, Twitter, Yahoo groups are only some of the social media sites that we can use to reach out to the potential clients and eventually drive traffic to our site. The opportunity to take your business online and reach thousands more customers is already in your hands. It’s either stay in the traditional OFF-line market where people sell and advertise through newspapers with less and less readers each week, or we reach out to the entire country through a website, or social media platform which is open to thousands or even millions of visitors. It’s time to think outside of the box.